Arsenal face Chelsea in the FA Community Shield on Sunday and you can nack the Gunners to win at enhanced odds with Coral Sportsbook! Find here how to get 33/1 Arsenal to beat Chelsea, plus £5 free bet if you lose! Arsenal are backable at 11/5 to ease past Chelsea in 90 minutes when these two teams square off at Wembley this Sunday! Wanna a bigger price? Don't miss this massive 33/1 Arsenal to beat Chelsea at Coral! It's very simple! Join Coral before the kick-off on Sunday (2.00pm) for 33/1 Arsenal to beat Chelsea instead of 11/5!! Make your first deposit of £5 or more and your enhanced odds will appear on home page - 33/1 Arsenal to win vs Chelsea! Coral are offering all our readers an UNMISSABLE 33/1 for Arsenal to beat the Blues (was 11/5), click this link to get the price boost in less than 30 seconds! Open a new Coral online or mobile account and bet on 'Arsenal v Chelsea - Arsenal to win 33/1'. 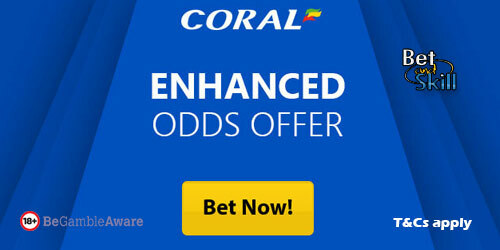 Offer available to UK & Republic of Ireland residents aged 18 years or over opening a new Online, Mobile or Coral Connect account in either £/€ currency through https://promotions.coral.co.uk/landing-pages/crazy-prices2, https://promotions.coral.co.uk/landing-pages/crazy-prices-online2 or the specific offer promotion box from coral.co.uk/sports/offers between 08:00 BST Friday 04/08/2017 until 14:00 BST Sunday 06/08/2017 with the exception of new accounts depositing funds with Moneybookers, Paysafe, Neteller or Skrill. Place your FIRST real money bet as a win single £/€1 on ‘Arsenal to win 33/1’ in our “My Markets” sections. "Claim 33/1 Arsenal to win vs Chelsea at Coral (2017 Community Shield price boost)"